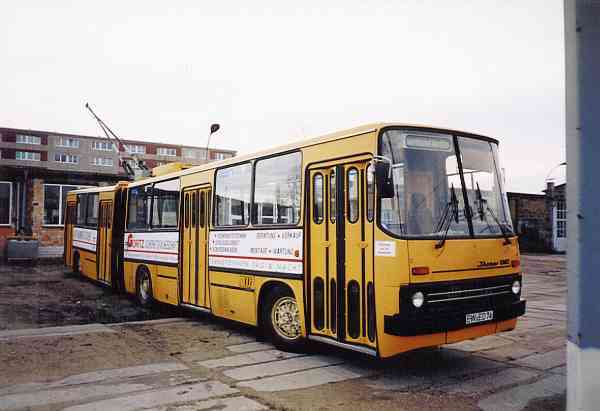 The articulated trolleybuses of the Hungarian type Ikarus 280.93 were manufactured by Ikarus in Budapest/Hungary. 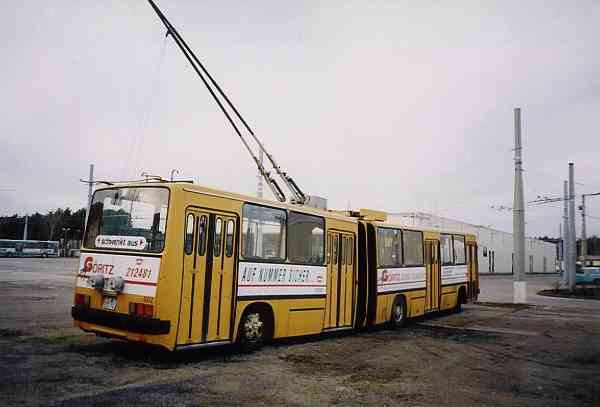 The GANZ factories Budapest/Hungary supplied the electrical equipment of the trolleybuses. The trolleybus is a three-axle vehicle. The A (first) and C (third) axles steer, and the vehicle is propelled by the B (second) axle. The vehicle has 4 doors. The doors are electrical-pneumatically actuated. For security, when the doors are closed 4 door control lights light up. The doors are opened and closed by the driver. The trolleybus is equipped with a 600 V-high voltage system as well as a 24 V-low voltage system that every other commercial motor vehicle also has. The vehicle is propelled by an electric motor with 196 kW performance by 2300 rpm. The electrical driving motor is designed for a nominal voltage of 600 V direct current. The electric motor receives the driving power over 2 current collectors from the overhead lines system. The right-sided current collector must always be in contact with the negative wire, and the left-sided current collector must always be in contact with the positive wire. The current collectors are attached on a framework on the trailer roof. This arrangement allows the trolleybus to drive (during parallel travel) up to 4,5 m to either side of the overhead lines. The driving motor is controlled via a direct current chopper. The direct current chopper is an electronic system, which enables an infinitely variable (pulse width) application of the voltage to the driving motor. It sends the voltage of the overhead line with a lasting frequency impulse-like to the drive motor. If the width of the impulses are modified, the voltage of the drive motor can be infinitely variable regulated. The inserted direct current chopper has several functions. Except the regulation of the armature current of the drive motor at large rate also the reduction of the energizing current is made by a thyristor (so-called field attenuation). The vehicle use the common thyristor type impulse control. The circuit is executed in such a way that when braking the drive motor operates as generator and back-feeds electricity into the overhead line. The vehicle has also a partial or full power regeneration during electrodynamic braking. The vehicle achieves a maximum speed of 65 km/h. The tire size 11.00-20 16 PR or 11.00R20 16 PR is used. The vehicle has 36 seats inclusively driver's seat and the maximum number of passenger related to the vehicle useful area is 110. The vehicle has an electrical auxiliary engine. This propels the compressor, the hydraulic pump of the guidance assistance as well as the 24 V-generator. The vehicle is equipped with air cushions. There are 2 air cushions at A- and C-axles, and 4 air cushions at B-axle. The air cushions are adjusted to 350-mm +/-10 mm between roadway and car lower edge. In the comparison with the ÖAF-Gräf & Stift NGE 152 the Ikarus 280.93 has pro and cons, however in the direct comparison does not necessarily fare badly.